B & H Engineering, P.C. has provided construction inspection services, as a prime consultant, to the New York State Department of Transportation for the Cross Bronx Expressway signs and lighting in Region 11. The project involved removal and replacement of existing sign structures and ground mounted signs along the Cross Bronx Expressway, Bruckner Expressway, Hutchinson River Parkway and Cross Bronx Expressway Extension. Existing aluminum sign structures were replaced with galvanized steel overhead span and cantilever sign structures; construction of new sign structure foundations involved drilling caissons over three to five feet in diameter in to rock, cobbles, boulders and at several locations involving high water table; structural modifications of existing retaining walls for new overhead sign structures. Existing bridge mounted sign panels and supports were removed and replaced with high visibility reflectorized sign panels and new steel support brackets; all ground and pole mounted signs were also replaced with high visibility reflectorized signs. 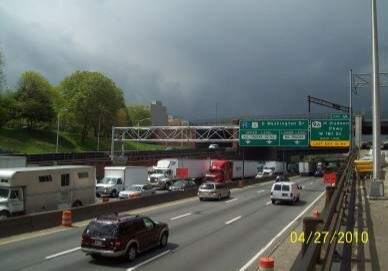 On the Cross Bronx Expressway, existing roadway and underpass lighting was removed and placed with new luminaires and light standards. New light standards were mounted onto new bracket anchors to the existing parapets or wall along Cross Bronx Expressway. New electrical feeder and control cabinets for the lighting were installed; asbestos remediation was performed at the existing control cabinets prior to their removal. Ancillary work on the project included replacement of both box beam and corrugated beam guide railing; installation of impact attenuators and concrete barriers. Project involved work zone traffic control during both day and night work hours on the interstates involved.